In an Active Directory (AD) you must have an accurate time synchronisation. For example, Kerberos requires correct time stamps to prevent replay attacks and the AD uses the time to resolve replication conflicts. The default maximum allowed time deviation in an AD is 5 minutes. If a domain member or domain controller (DC) has a higher or lower time difference, the access is denied. As a result, a user cannot access shares or query the directory. Samba supports the ntpd from http://ntp.org and chrony from https://chrony.tuxfamily.org/ . The daemon synchronises the time with external sources and enables clients to retrieve the time from the server running the daemon. From the above, you can see that only the PDC emulator DC gets its time from external time servers, all other DC's get their time from the PDC emulator, all other workstations get their time from any DC. There is however a problem with this, Windows clients get their time from the PDC emulator DC and if this goes offline, they will not use the other DC's and the other DC's will be looking for the PDC emulator DC. As a workaround for this, set the same external time servers on all DC's, then if the PDC emulator goes offline and cannot easily be restarted, transfer or seize the PDC emulator role to another DC. By default domain joined Windows clients synchronize their clock via NT5DS with AD-DC's. The NT5DS protocol uses digital signatures. These can be provided by Samba if the time server runs on the same server, and is configured as described on this page (with options mssntp and ntpsigndsocket). Alternatively you could configure all machines to do standard ntp, but NT5DS is recommended. Note that authenticated time synchronisation with Windows 2000 clients is not supported. Typically, the ntpd daemon read its configuration from the /etc/ntpd.conf file. # Local clock. Note that is not the "localhost" address! # No restrictions for "localhost"
For further information about the ntpd access control, see http://support.ntp.org/bin/view/Support/AccessRestrictions. If you have SELinux enabled on your server, see Time Synchronisation - SELinux Labeling and Policy. Typically, the chrony daemon read its configuration from the /etc/chrony/chrony.conf file. # information about usuable directives. # Uncomment the following line to turn logging on. # Stop bad estimates upsetting machine clock. # real-time clock keeps local time or UTC. It overrides the 'rtconutc' directive. # real-time clock. Note that it can’t be used along with the 'rtcfile' directive. # one second, but only in the first three clock updates. systemd-timesyncd >= a recent linux distro that supports and runs with systemd. The following is a minimum conf file that synchronises the time with the Samba Active Directory (AD) domain controllers (DC) DC1 and DC2 and does not provide time services for other hosts. There are a few ways to setup systemd-timesyncd. The systemd-timesynced daemon reads its configuration from the /etc/systemd/timesyncd.conf file, or from your network configuration defined in systemd's .network file /etc/systemd/network/your.network, or by dhcp settings. Option 1: Using the /etc/systemd/timesyncd.conf file. Enable the following. In this example the fallback NTP servers are also used, this is not mandatory. Option 2: set your time servers in your network configuration (for example: /etc/systemd/network/20-wired-dev1.network). After the changes enable and start the time daemon. and apply the new time-zone. Why use the systemd time daemon? It works fine for a member server and doesn't require the installation of any extra software. The following describes the basics of how to configure time synchronisation on a Windows domain member. For further details, see your Microsoft Windows documentation. Windows AD domain members will use any DC as their default time source. If you have set up ntp on the DC as described on this page, you usually do not need to reconfigure the clients. Alternative configuration options for the clients are described below. For more information about the time synchronisation and hierarchy in an AD, see http://technet.microsoft.com/en-us/library/cc773013%28v=ws.10%29.aspx#w2k3tr_times_how_izcr. Log in to a computer using an account that is allowed you to edit group policies, such as the AD domain Administrator account. Open the Group Policy Management Console. If you are not having the Remote Server Administration Tools (RSAT) installed on this computer, see Installing RSAT. Right-click to your AD domain and select Create a GPO in this domain, and Link it here. Enter a name for the GPO, such as Time Sources. The new GPO is shown below the domain entry. Right-click to the newly-created GPO and select Edit to open the Group Policy Management Editor. To enter multiple server, separate the individual entries using a space. Keep the NT5DS type setting. Update the additional parameters, if necessary. Close the Group Policy Management Editor. The default Type NT5DS ignores the parameter NtpServer, and syncs with the DC. 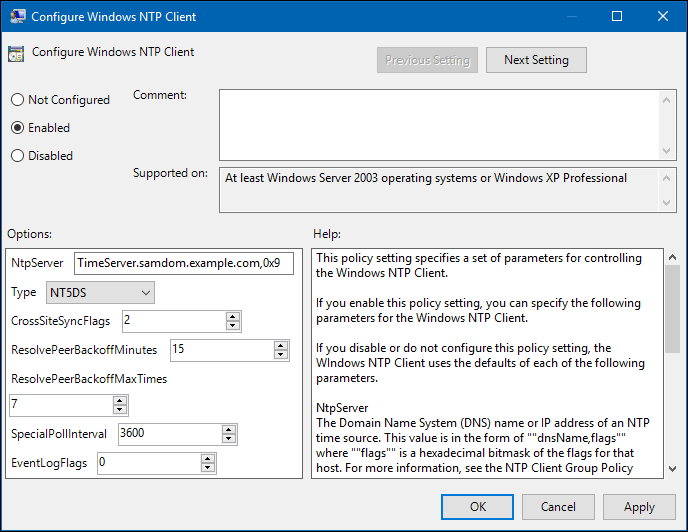 If ntpd on your DC is not configured for mssntp with ntpsigndsocket, use Type NTP. If a client will not be able to connect to the DC for a long time (for example a laptop), use Type AllSync and set NtpServer to "time.windows.com,0x9". This will cause the client to try both NT5DS to your DC, and NTP to NtpServer. This page was last modified on 8 April 2019, at 15:08. This page has been accessed 77,501 times.